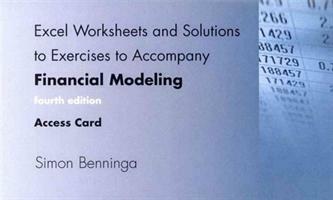 Downloadable Excel worksheets and solutions to end-of-chapter exercises accompany Financial Modeling, Fourth Edition, by Simon Benninga. Access codes are required to download the supplemental material. New print copies of this book include a card affixed to the inside back cover with a unique access code. If you purchased a used copy of this book, this is a separately purchased printed access card. The late Simon Benninga was Professor of Finance and Director of the Sofaer International MBA program at the Faculty of Management at Tel-Aviv University. For many years he was a Visiting Professor at the Wharton School of the University of Pennsylvania.